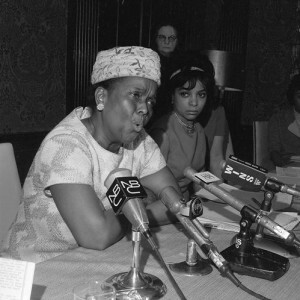 “The most powerful person in the struggle for civil rights in of the 1960s was Miss Ella Baker, not Martin Luther King,” said Stokely Carmichael. Two St. Paul, Minnesota high school students—Siena Leone-Getten and Paying Lor—decided to learn more about this influential woman who remains so hidden in history. Not only did they research her life history, they also produced a well-researched ten minute documentary on Baker that can be used to raise awareness about her decades of activism and her philosophy. Leone-Getten and Lor’s film, Ella Baker: A Legacy of Grassroots Leadership, won first place in the senior group documentary category for the 2015 National History Day (NHD) competition. It can now be viewed and shared online. Watching the film, it is evident that Leone-Getten and Lor did extensive research. They started with books and primary documents at the library and then conducted numerous interviews. Here, in their own words, is a summary of their interviews and production process. Our first interview was with Julian Bond, a founding member of the Student Nonviolent Coordinating Committee (SNCC) who worked closely with Baker. We also spoke with these SNCC members who worked alongside Baker: Hollis Watkins, Judy Richardson, Dorothy Zellner, Penny Patch, Claire O’Connor, Leslie McLemore, and Connie Curry. We learned about her work with students, her leadership style and how she influenced them as activists. Professor J. Todd Moye, her most recent biographer, explained to us how she organized SNCC and influenced people and organizations with her grassroots leadership. Dr. Shana Redmond, the Ella Baker Visiting Professor at USC, focused on the importance of Baker’s organizing style today. We also spoke with Taylor Branch, who has written extensively about the Civil Rights Movement, and who helped us to understand about the organizational differences that Ms. Baker had with Dr. King. We both have enjoyed creating documentaries. This year, we were able to strengthen our research skills, finding interesting footage, photos and documents. After writing the script, we recorded our voiceover, edited interviews, compiled footage and images, and selected music. Leone-Getten and Lor’s hard work paid off. They produced an award-winning film that will inspire viewers to learn more about the life and legacy of this remarkable woman.